This book that The Friday Morning Bookclub read, centers around a 16-year-old Dutch girl named Griet. Can you name the book? All comments and answers are welcomed! For a little help, check out our complete book list. Thank you Joan! 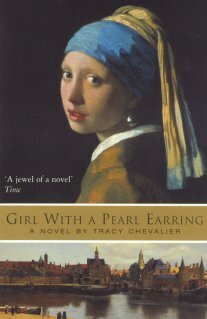 Girl with a Pearl Earring by Tracy Chevalier was a book club favorite! It is the story of Griet, the beautiful young girl behind one of Johannes Vermeer’s most famous paintings. A delightful book! The Dutch Girl, Griet, is in the book, “Girl With A Pearl Earring”. That book was one of the first books we read, and then some of us went together to see the movie. How time flies!!! Thank you Joan! Girl With a Pearl Earring is correct! It was also the second book we read, which means it was close to 10 years ago. You are right! Time sure does fly by!